With the new year starting, it's a great time to check out the latest in home design trends. Whether you're building a new house, redesigning a room or just looking to perk up an older design - color trends can serve as a fun inspiration for your flooring choices. Let's check out a few color trends that we are excited about here at Indianapolis flooring store, Kermans. Color does so much for a room. It stimulates your senses and inspires emotion. Your color choices - particularly with your flooring - also help define and connect spaces. Here are three color trends we think you should consider for your flooring choices this year. We are seeing more and more gold - think deep yellow tones - work themselves into flooring design. 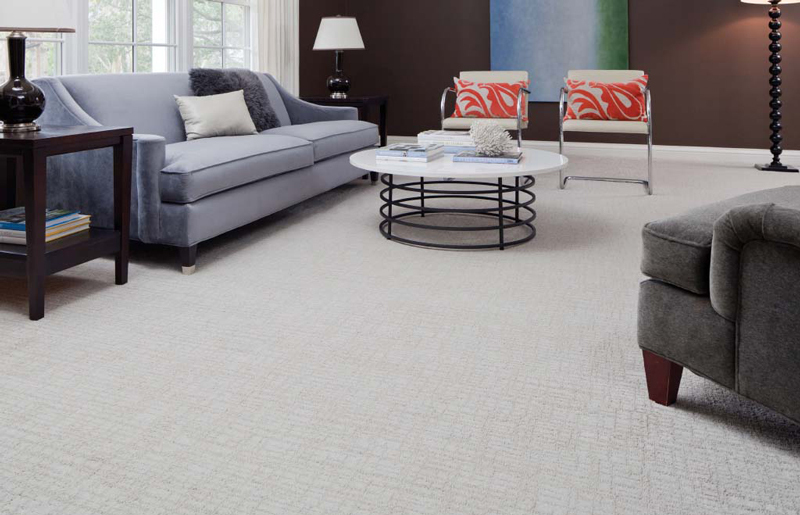 While you can certainly find an entire carpet this color or even look at golden stains for your hardwood flooring, we think one of the best ways to take advantage of this trend is with patterned carpet. 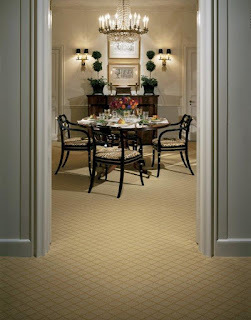 The dominant color of the carpet can be one that already exists in your room and then look to gold to introduce the design and a subtle splash of color. Area rugs are another option to layer on top of an existing floor and add some new color to the room. Another way to take advantage of this trend - especially for the metallic end of the gold spectrum is with tile. Metallic gold can add both texture and shine to a room and tile is a natural for this trend. Read our article: Using tile for metallic accents. Blues rarely go out of style but this year we're seeing a trend towards darker, deeper shades of blue. Navy blue and indigo are popping up on more and more trend articles. Afraid of dark carpet? Don't be. It can make a room feel cozy and luxurious all at the same time. Depending on how you pair that dark blue carpet with furniture, you can make the floor feel contemporary or traditional. Dark blues make a strong design statement and one that isn't likely to go out of style anytime soon. Looking for more design trends? Follow our Facebook page where we highlight trend alerts and tips! Wnat to explore design trends for your flooring? Schedule a free consultation with one of our expert design staff. Let them know ahead of time what you're considering and they'll have some samples laid out and ready when you arrive.